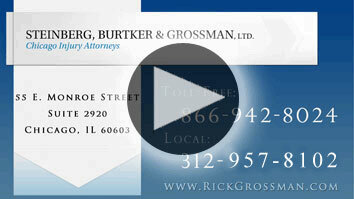 Steinberg, Burtker, & Grossman is one of the top personal injury & medical malpractice law firms in Chicago. We have been providing personal service to injured people for over four decades. Our law firm of personal injury attorneys in Chicago, Illinois, was initially established by partners Allan R. Steinberg and John C. Burtker. Richard J. Grossman is in the Top 100 Trial Lawyers according to the National Trial Lawyers Association. Three decades ago, they were joined by Richard J. Grossman, a former Assistant Attorney General and chief of the division responsible for defending the State of Illinois in all of its state and federal complex litigation. Early in his career, attorney Grossman established himself as a tough and able litigator trying large cases against highly experienced attorneys who were senior partners in large powerful law firms. After leaving the Attorney General's office in 1980, Grossman established a private practice concentrating in personal injury litigation. He met his soon-to-be partners in court as opponents. Attorney Grossman not only won the case, but impressed Steinberg and Burtker so much that they immediately invited him to join the firm. Thirty years and hundreds of trials later, Attorney Grossman leads our personal injury team. To learn more about Mr. Grossman's successful trial results, visit our Representative Cases page. Both Allan R. Steinberg and Richard J. Grossman have achieved a "Preeminent 5.0 AV®-rating for superior legal ability and ethical standards" under the Martindale-Hubbell's peer review system and Mr. Grossman was named as one of the top personal injury attorneys in Illinois in, "Illinois Super Lawyer", by a survey of his peers, which was published by Chicago Magazine. The personal injury service we provide is personal and it is hands-on from beginning to end. In many other high profile personal injury law firms the prospective client will initially meet and speak with a well-known partner but will never see him or her again. Instead, the client's case is assigned to a young inexperienced associate attorney to investigate, take depositions of parties, doctors, and expert witnesses. The trial is the culmination of this work and if it is not performed correctly, the results can be disastrous. Is this how you want your case handled? When a person chooses the law firm of Steinberg, Burtker & Grossman to handle a Chicago personal injury case, that person will get representation directly from a highly experienced partner trial attorney. A person who has tried hundreds of cases and knows what must be done to win. We do not delegate important duties to associates or paralegals. 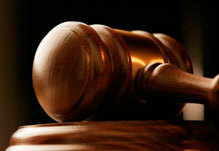 Our attorneys handle every step, from talking to the accident victim to arguing the case in front of a jury. We believe that is the level of service our clients deserve. Does your Attorney Have the Financial Resources to Pursue your Claim? Although personal injury claims are handled on a contingent fee basis and you will not be charged a fee unless a recovery is had that is only part of the story. To effectively win a personal injury lawsuit your attorney must have the financial resources to pay for the court reporting, private investigator, expert witnesses, doctors, exhibits, travel, airfare and hotels. If your attorney lacks the financial resources to pay for these expenses - which can range from $5,000 to over $300,000 - your case may be compromised and lost. It is fitting that our partners met in the courtroom, because we are trial attorneys. Our lawyers know that, no matter how hard we try to get them to, our opponents may simply be unwilling to provide a settlement that truly compensates our client. In these cases, we are always ready and willing to go to trial. In fact, we enjoy it. We are quick-thinking overachievers with a passion for winning the most challenging personal injury cases, including car accident claims, product liability claims and more. When evaluating the settlement value of a case insurance companies routinely want to know "who is the plaintiff's attorney." The reason for this question is they know which lawyers are the most experienced and best at getting maximum recoveries for their clients. When insurance adjusters hear that Steinberg, Burtker & Grossman is representing the client, they know that they must settle the case for its maximum value.